Have you noticed a change in your Google search results? Notice no ads appearing on the right hand side? 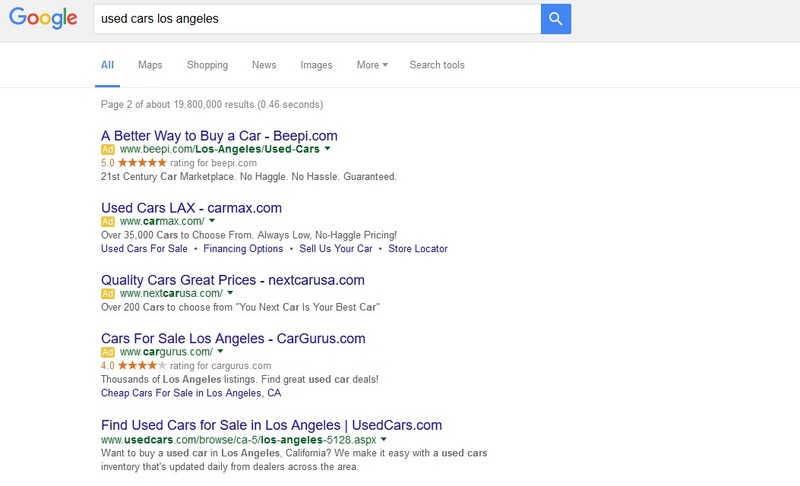 Try searching for “used cars” in Google. Google used to have 11 ad spots on the homepage and now they have only 4 ads! Rumor has it, Google has been testing 4-ad search engine results pages (SERPs) for the past couple months which has stirred up an assortment of opinions for those who use Google AdWords. According to MozCast data, on February 18 Google SERP top ads blocks displaying 4 ads rose to 18.9% and then again increased to 36.4% on February 23. These numbers are impressive because before February SERP top ads blocks displaying 4 ads only accounted for about 1%. Here is an example of what we are talking about. We count only 4 top ad blocks in the SERP and no ads appearing on the right hand side (about 8 ads used to appear here). MozCast recorded 10,000 searches and the data shows that ads now max out at 7 per page = 25,755 ads. Prior to February 16th, 11 ads would appear on a SERP page = 43,740 ads in 10,000 searches. That is a 41.1% decrease in AdWords. Even though Google hasn’t specifically explained why they are testing this change, we wonder if Google is finally making their move towards primarily mobile. Dr. Peter J. Meyers writes in his article, Four Ads on Top: The Wait Is Over, "Google has made a public and measurable move toward mobile-first design. Since mobile doesn’t support the right-hand column, Google may be trying to standardize the advertising ecosystem across devices." Could this only be for commercial related ads? Well when we did numerous searches that were automotive related we noticed only 4 ads appeared on the SERP. This makes winning one of the top 4 ad blocks extremely competitive. Quality score will be weighed heavier as these ads enter the auction.